Migration unites birds – and people – across the globe. Audubon of the Western Everglades’ first Winter Stewardship Anchor Steward, Kim Savides, is using her passions for bird migration to inspire Collier County beachgoers this winter. As a longtime birder and seasoned field biologist, Kim has traveled the country researching migratory birds, allowing her to bring a breadth of knowledge to the beach from near and far. Growing up along the shores of Lake Erie, Kim witnessed the annual migration of millions of birds from warblers and sparrows, to blackbirds and waterfowl. She was captivated by these perfectly timed, mass movements of birds and attended the State University of New York – College of Environmental Science and Forestry, earning a BS in Wildlife Science. While in college, Kim started her biology career conducting avian point counts and nest searching for Black-throated Blue Warblers in New Hampshire, where she returned for three subsequent breeding seasons. After graduating, Kim traveled to Point Reyes Bird Observatory (PRBO; now Point Blue Conservation Science) along the California coast where she received rigorous training in bird banding, public outreach, and data and crew management. At PRBO, Kim earned North American Banding Council certification as a bird bander and has used her experience to band over 5000 birds in 8 different states and serve as Bander-in Charge at two different high volume banding stations. 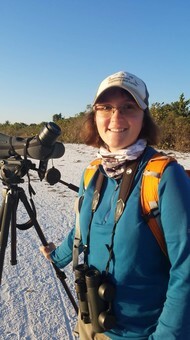 As a bander, Kim has used a variety of innovative techniques to study migration, including geolocators, MOTUS radio tags, and ptilochronology (feather growthbar patterns), and continues to contribute to the science community. Last winter, Kim stepped into the shorebird scene and joined Audubon Florida and Rookery Bay National Estuarine Research Reserve to expand their shorebird monitoring and outreach programs in Collier County. While there, she gained appreciation for Florida’s lagoons and mudflats, and all the birds they attract – especially the banded birds – and has returned this winter in her new capacity as Collier’s first Winter Anchor Steward. Kim is out on our beaches using her experiences and knowledge of migration to connect beachgoers to their environment, no matter where in the world they or the birds are from. Using life histories and banded members of the flocks around her, Kim synthesizes stories of individual bird migrations, integrating local-scale band resightings and historic movement patterns. By communicating these stories of migration and struggles of individual birds and colonies, she ensures everyone walks away with an appreciation for the birds not only as an aesthetic piece of the beach scenery, but also as awe inspiring creatures with fantastic journeys and conservation needs not only here, but afar as well. Thank you, Kim, for your priceless contributions to Florida's shorebird and seabird conservation efforts! Today's the day! 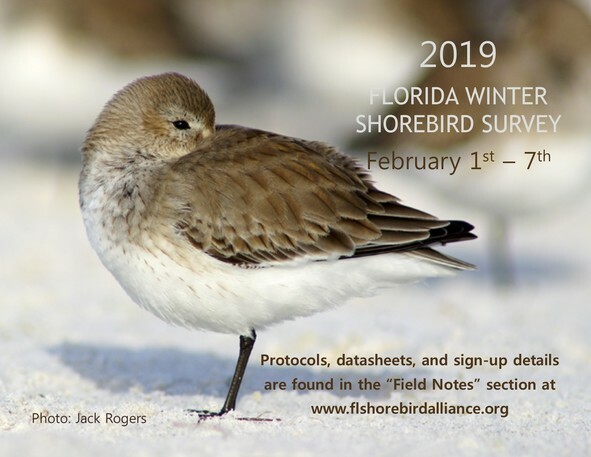 2019 is the 11th anniversary of the Florida Winter Shorebird Survey If you haven't already signed up, we are enthused to invite you to participate in the mid-winter survey that serves as a statewide snapshot of shorebirds and seabirds across the state. The primary objective of the Winter Shorebird Survey is to better understand the winter distribution of shorebirds and seabirds in Florida. This annual survey will allow us to recognize long-term trends or changes in winter population sizes and distribution. It will also help us identify key wintering sites- information that is much needed to guide future conservation efforts, particularly for our state or federally listed focal species. If you plan to participate in this year’s survey please review the 2019 Protocol, review the list of routes and sign up for an existing route or add a new route on the Route Survey List. After the survey is complete, please submit your data by March 1st into the Google Form. If you have questions about a route or the survey, please contact the Regional Coordinator in the protocol. Report all GPS locations in Decimal Degrees. We look forward to participating alongside you in this fun winter survey. Thank you for contributing your vital data. Please contact your coordinator if you have questions. It’s that time of year! The 2019 breeding season is just around the corner and the FSD will re-open in March. The FSD data team has put together a series of webinars tailored for monitors with all levels of experience. 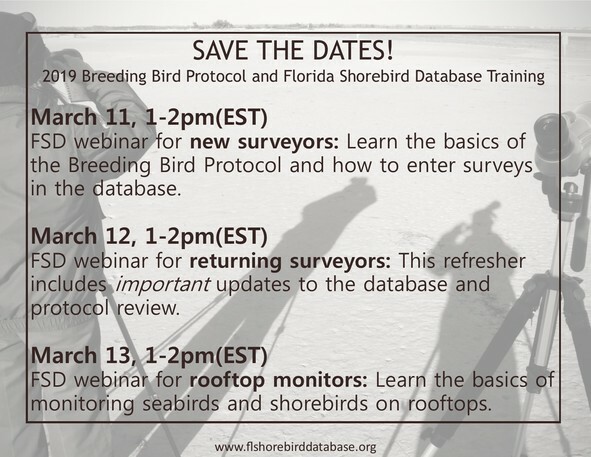 FSD webinar for new surveyors: Learn the basics of the Breeding Bird Protocol and how to enter surveys in the database. FSD webinar for returning surveyors: This refresher includes important updates to the database and protocol review. FSD webinar for rooftop monitors: Learn the basics of monitoring seabirds and shorebirds on rooftops. Details and instructions will be emailed to registered participants prior to the webinars. Registration is now open for the 2019 webinars! The 2019 breeding season will be here before we know it. There are many ways to get involved in conserving Florida's charismatic shorebirds and seabirds. Every breeding season there are opportunities to get involved through: posting important nesting areas; educating the public by stewarding at breeding colonies and nesting sites; and monitoring birds nesting on the ground or at one of the many rooftops that host nesting birds. 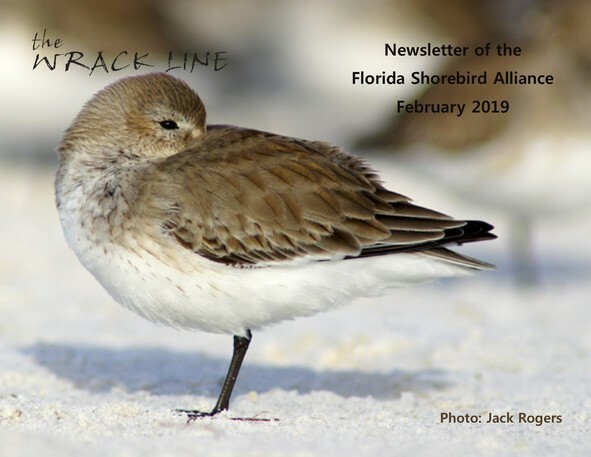 If you would like to get involved in the 2019 breeding season activities, email shorebird@MyFWC.com for more information about your local partnership and opportunities. You can also learn about local efforts by joining the flock on social media: Florida Shorebird Alliance Facebook Group.